- Letters (27 pcs. Set ) a to z, . We are offering Interchangeable Steel Punches to our client. - Single piece made from Hardened and Tempered Tool steel. - Tip Hardened to 45-52 HRC. - Striking head and front taper centerless ground. 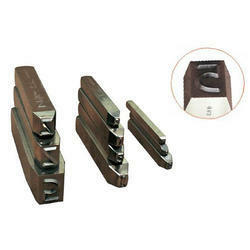 We are offering Metal Punches to our clients. We offer Special Punch that are specially designed and manufactured to meet the specific applications of different industries. For example we fabricate Special punches in different lengths of 27 mm, 30 mm, 35 mm, 50 mm and more to meet the requirements of the PCB industry. These punches can be offered in different tolerances, material and technical specifications of our clients. Riding on vast volumes of expertise in this arena, we are occupied in offering EN31 Punch. Trammel points are used to draw circles of any diameter by using a bar (usually made of wood) of appropriate length clamped to the two points. A pencil may be substituted for one of the point.Note- Our product’s color is black or white. It can be changed as per customer’s choice or requirement. 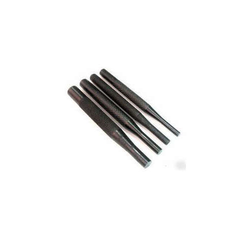 Pin Punches are manufactured from high quality carbon steel, accurately hardened and tempered so that the Pin will withstand continuous use and the striking end will not splinter. These are induction hardened to ensure consistent hardness and a special tempering process prevents the head from fracturing, thereby preventing accidents. We manufacture superior quality punches by using in house facilities like, CNC vertical machining center, CNC wire cut machined and more. Made from superior grade raw material, the range of sheet metal components can be delivered in shortest time interval to customers. With rich industry experience & knowledge, we have been able to provide the best array of Perforating Punch/Perforating Punch Tools. In order to keep pace with the never-ending demands of customers, we are involved in offering a wide range of Multi-Tip Punches to increase the productivity. We hold the expertise in manufacturing and exporting Letter Punches Set across the world. Our range is manufactured using superior quality steel that are in compliance with international quality standards. These punch tools are perfectly arranged and placed in the wooden box. This is portable, non ductile and easy for working.